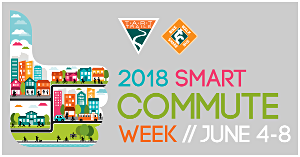 Smart Commute Week is an annual celebration held during the first week of June. The week consists of events that promote cycling, walking, taking the bus and carpooling. Smart Commute is for everyone. Free daily breakfasts are hosted at various locations around town for smart commuters. Every year community members challenge each other to a friendly competition known as the Smart Commute Week Challenge. Last year NMC came in 7th and we hope you join the team this year and help us reach the top! To join, fill out the brief Google Doc form here. Wellness walks at all 4 NMC Campuses- Don’t miss it! Join Chris Barr for a brisk walk around your campus- only a 15 minute commitment! Although the challenge wraps on Friday, May 11, you have until May 16 to be sure all of your steps are entered and accounted for! It is recommended to log into you Blue Cross site to be sure the automatic counting is correct. Those using the Google Tracking Sheet should finalize their information by May 16 as well. Winners will be announced by the end of the week!